Former Virginia Gov. Terry McAuliffe suggested he could run against President Trump for president in 2020. Democrat Terry McAuliffe said he would be the party’s best choice to “take on” President Donald Trump in 2020. 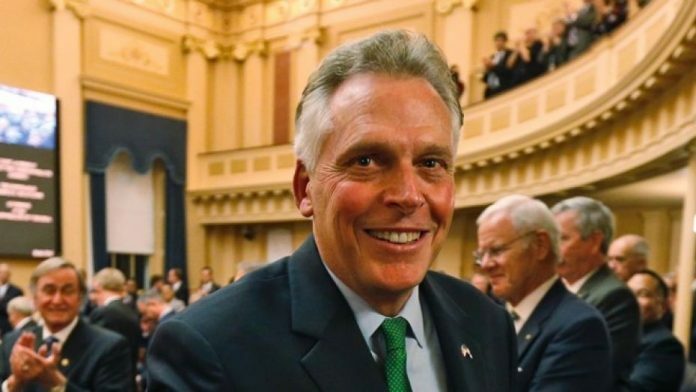 “Who better to take on Trump than me?” McAuliffe said when asked by the Washington Free Beacon about a potential 2020 run for president, strongly indicating he will indeed throw his hat in the ring. The former Virginia governor, Democratic National Committee chairman, and longtime party fundraiser’s name is regularly included amongst the crowded field of Democrats thinking of running for president. McAuliffe has been said to be “seriously considering” a presidential run but recently dodged a question from CNN’s Jake Tapper on who would give Democrats the best chance to take back the White House, though he did indicate a belief that former governors with executive experience such as McAuliffe are better suited for a run. McAuliffe said he knows he can stand up to Trump because he’s known him for a long time, a relationship that led to Trump cutting a $25,000 check for McAuliffe’s unsuccessful 2009 run for governor of Virginia.